Today I thought I'd share with you some snaps from my Instagram this morning. It's been a really great day so far. I'm currently off work for 2 weeks, so I'm trying to squeeze as much in as possible, and make the most of each day! 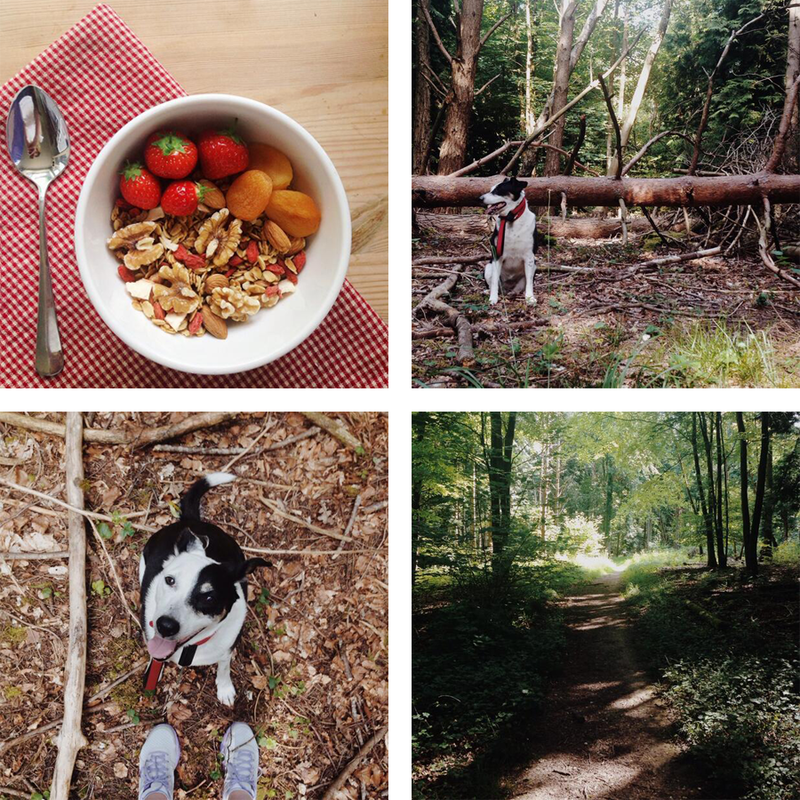 This morning I took Ellie to some local woodland for a bit of a run, which we both really enjoyed. The thing I love about running in the morning is that you can do nothing else for the entire day, but still feel good about yourself for getting out there and doing something in the morning. Once back at home, I grabbed all of the nuts, berries and dried fruit I could find, and sprinkled them on my granola, and topped with almond milk. Definitely a new favourite breakfast of mine! Over the next couple of days I have a few more things lined up for my blog. Ben and I are going camping in the New Forest tomorrow, and then we're off to Brighton for a few days next week. We *might* vlog some of it, but I'm not sure yet! I'd definitely like to document our trip in a different way than usual, so who knows. Keep your eyes peeled! I should also have another video up within the next week, as well as some regular blog posts. Looks like you've had a lovely morning :) Your god is such a cutie! Soo glad you have posted! Loved reading this short n sweet post - that breakfast looks/sounds amazing. I hope you have a great time in Brighton too, I have just been reading your 'Birthday in Brighton' post too, how strange! Hope you enjoy camping and I can't wait to read more from you. Thanks Rebekah, how strange indeed! Having this time off is making me wish I could blog more all of the time, it's so liberating to have more time to myself. Your breakfast looks super healthy and yummy! Ellie is a real cutie, dear Amy...love that black patch over her eye!! And although I'm not much of a "woods" person myself - I prefer the beach! - your photo makes it look mighty inviting!! This is a lovely post! And I totally agree about running in the morning and feeling like you've accomplished something for the day!